French title designer Kook Ewo, who you might know from his titles for Silent Hill, designed the uncanny opening title sequence. Ewo, who attended the black carpet premiere in L.A., emailed us the 'Making Of' story from his hotel room. 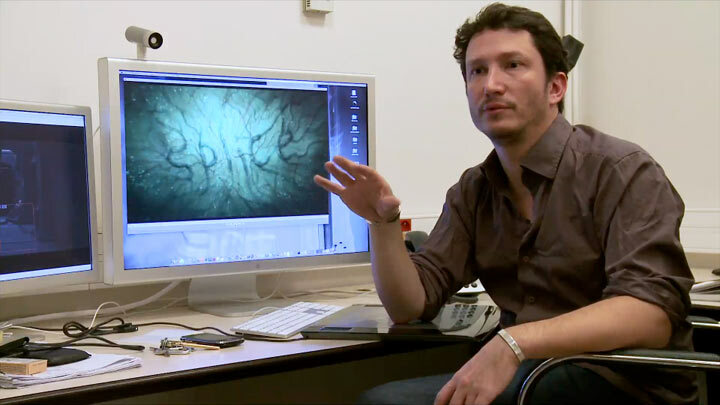 Paris-based visual effects studio Chez Eddy made a 'Making Of' film, which features interviews with Splice director Vincenzo Natali, Kook Ewo, VFX supervisor Jean-Charles Kerninon, and others who worked on the title sequence. 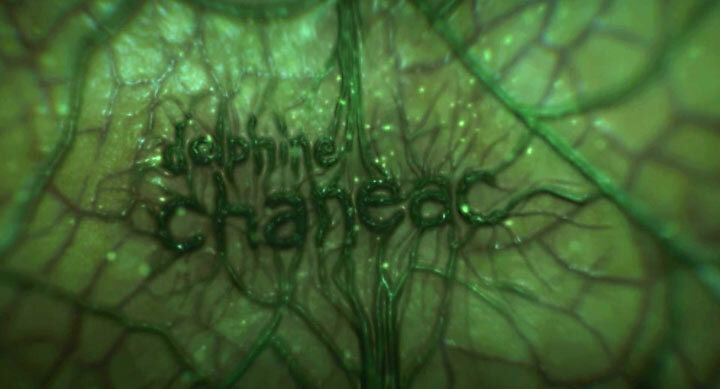 How much did you see of the movie before you started working on the opening title sequence? “When Vincenzo Natali and I first met, he was right in the middle of the editing and preferred not to screen the movie yet,” recounts title designer Kook Ewo. “He explained me what the movie was about, its themes, the story, characters, etcetera. Then he sent me a PDF book showing the designs of the creature, the general intentions... plus some shots from the different VFX houses (CORE, BUF and Mac Guff) that worked on the movie. “When we first met, Vincenzo's idea was to show three different types of skins – vegetal, animal and human – to illustrate the idea of splicing (*) different species. The actors names would emerge from underneath the skins, as if they were being punched up. Vincenzo asked me to imagine the sequence in terms of look and narrative. "My first suggestion was that – in order to introduce some disturbance – the skin could be a mix between human and other types of skins, so the viewer would never truly understand what he's looking at. "Then I suggested to put the sequence into an amniotic liquid – dirty, organic, with very bad lighting to avoid as much as possible that perfect, slick 3D look. "Initially I was thinking of a kind of mix of live action shots and 2,5D compositing in After Effects, but we very quickly got the idea that full CG would be more efficient. Plus, I suggested we add a very subtle depth-of-field to achieve more realism, and to give the evolving particles a nice blurry aspect. "I suggested to use a 'passive' camera. Weightless. It would only move when hit by the random movements of the creature in the amniotic fluid. The camera would have gone from one scene (skin) to another, only floating. Unfortunatly this idea was technically too complex, so we bought the 'exploring robot' ride. Before we could start we needed to find the perfect company to make the sequence and I instantly thought of Chez Eddy. I previously worked with them on my short film "Black Night is Falling" for which they created astonishing visual effects. They didn't have a lot of experience in realistic rendering, so I asked production to get them an R&D budget. Fifteen days later we delivered the first tests to Vincenzo and the production company. "The only thing that Vincenzo and me were not completely satisfied with was the concept of the type pushing up from under the skin. The effects looked great, but it would have been too repetitive for each actor's name. So we came up with the idea to integrate every name in a different way. "Then I had to make the storyboards - with Thierry Segur, an amazing storyboard artist - and the previz of the sequence. Plus, Vincenzo and had to find some skins references. "Finally we were ready to start the huge production work at Chez Eddy. During the five following months, an average of five guys, supervised by Jean-Charles Kerninon, worked on the sequence. As far as I know, they used Maya (3D), Digital Fusion (for compositing), Photoshop and After Effects. "During that five-month period, Vincenzo and I validated all the different phases several times a week, mostly by email. Very efficient when it's about full CG! "Last but not least I added the crew titles, which felt almost like a holiday in comparison to the work done by Chez Eddy. Making of the Splice Main Title - Storyboard art from Submarine Channel on Vimeo. You work in Paris, yet most of your recent title sequences are for American movies. Shouldn't you relocate to Hollywood? “That could make sense in a way. But being 'exotic' is good too. Plus, it's easy and fun to take a plane and spend few days or weeks somewhere else. If a director wants to meet me, he can just ask and I can meet him the day after. The job of a title designer is all about ideas. It doesn't matter where you are. And with internet connections, Skype, remote access, FTP and FedEx for final renders, I sincerely think it's no less efficient to be in Paris or anywhere else. "Where it can be a problem is with producers who want to spend their money in their own country, or when there is no co-production plan with France. But there's always a solution. Title sequences are usually not big buget productions, so that helps. "But the most unbeatable reason for me to stay in Paris is that it gives directors a reason to visit Paris for few days, enjoying life! * Splicing: To join together segments of DNA to form new genetic combinations. Article: Remco Vlaanderen, © Submarine Channel. 4 June 2010. Last update: 18 November 2012. 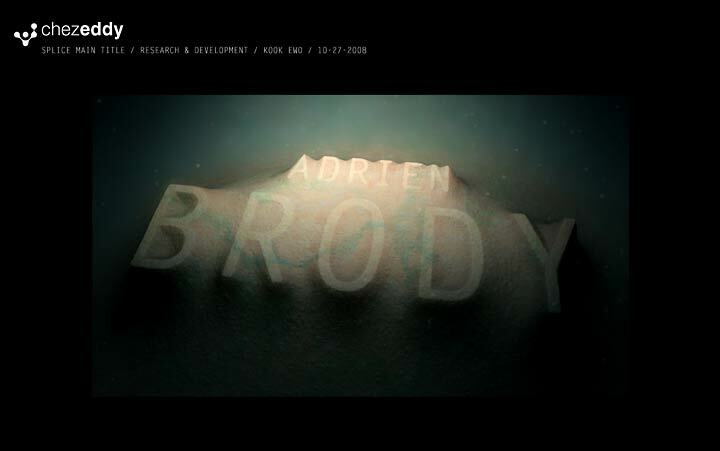 Born in 1979, Kook Ewo is a Paris-based title designer and director, who first came to prominence with his work on Silent Hill. He has since started directing commercials, shorts movies including Sept. and Black Night is Falling. 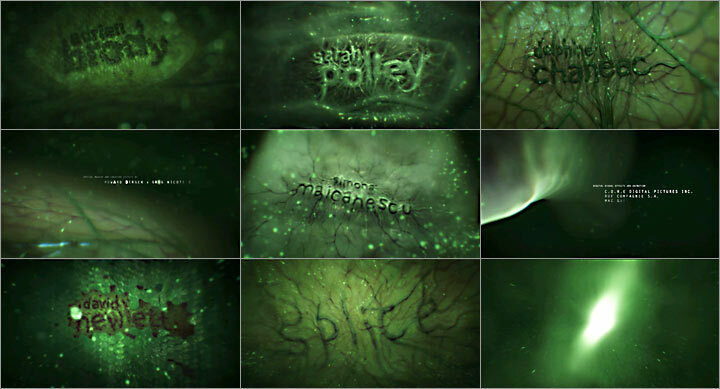 Ewo's main titles include Splice, Fracture and Solomon Kane. He is a teacher at Goblins School of the Image (Paris' school of Visual Arts) in the Motion Design section. In 2010, Watch The Titles interviewed Ewo in his studio in Paris. In 2011, Ewo co-founded Motion + Design, a fascinating initiative to found the world's first physical center for motion design. Thanks Izzy, I didn't know about that video. I embedded it! It was a great movie. Make you wonder how far we can go with splicing dna.